The launch was one of Disneyland Paris’s most star-studded to date featuring performances from Daniel Powter before the opening of the celebrations to guests the next day by Miley Cyrus from the Disney Channel series Hannah Montana. On top of all the new entertainment, the Tarzan and Lion King stage shows were almost performed multiple times daily (as well as the Walt Disney Studios stage shows). The big selling point of these celebrations were, of course, the ‘new land’ featuring two new attractions. Toon Studio opened on 9th June 2007, both Crush’s Coaster and Cars: Quatre roues rallye opened at this time. The Crush’s Coaster has become synonymous of long queues and guests, young and old, wait to be part of this rush through the East Australian Current (EAC). 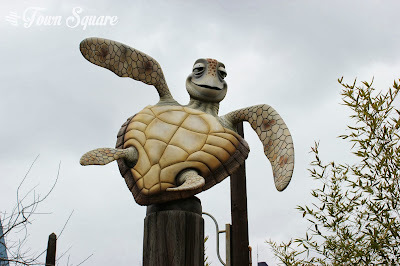 This attraction has stroke a perfect balance between the thrills and storyline, as we board a shell and go through the reef where guests find Nemo and Squirt, suddenly guests meet our Shark ‘friends’ and glide through the EAC whilst spinning 360 degrees, such an attraction is unique to Disneyland Paris. Cars Quatre Roues Rallye is a more simple attraction based on the world of Radiator Springs, but that certainly doesn’t make it any less enjoyable. Guests queue through Flo’s admiring the wall displays (which are often humorous) before boarding a car in an experience that is quite similar to the Mad Hatters Tea Cups in Disneyland Park, but perhaps slightly more thrilling. Main Street USA received decorations in the form of giant banners up the street which lit up at night featuring the 15th Anniversary emblem and one of the ‘mascots’ of the celebration Lumiere. The biggest change was the classy castle decoration. The lower window being covered over by the 15th emblem and each turret receiving a Disney character holding a candle. Each night, as Disneyland Park prepared to close its doors to guests, a special celebration took place in which these candles would magically come to life with a bit of help from Mickey Mouse in a ceremony featuring dancing and characters ‘Candellebration’. 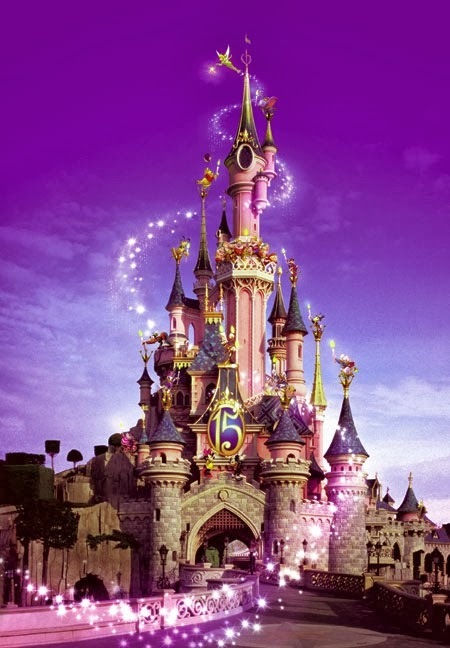 In fact, Disneyland Paris extended its 15th anniversary for an extra 12 months with even more new attractions and shows, it was even marketed as being bigger than the first year with the tagline ‘The celebration continues BIG TIME!’. Urgency was added into the marketing from the outset of this extended celebration as the white rabbit holding a pocket watch appeared in the promotional material ensuring we visit the resort before we’re ‘out of time’. Despite the April inauguration, this attraction actually opened in December 2007, Stitch Live! however, did open closer to the press event. Stitch Live! allows guests in Disneyland Paris to watch, and become part of, a transmission to outer space; not only that, but guests could actually talk to Stitch. . This attraction is offered in multiple languages and replaced the former Disney Channel Studio Tour, Cast Members working here still wear costumes featuring the Disney Channel logo. 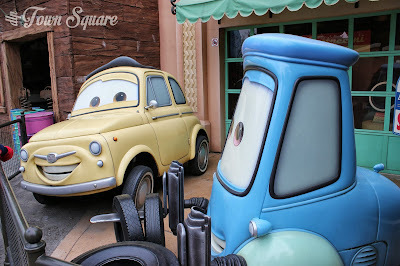 This extended year also saw us wave goodbye to the Disney Cinema parade, but we’d have to wait until March 2009 for Disney’s Stars ‘n’ Cars parade. Disney welcomed in the Enchanted Fireworks which ran from 2008 until 2011 before making room for Disney Dreams! 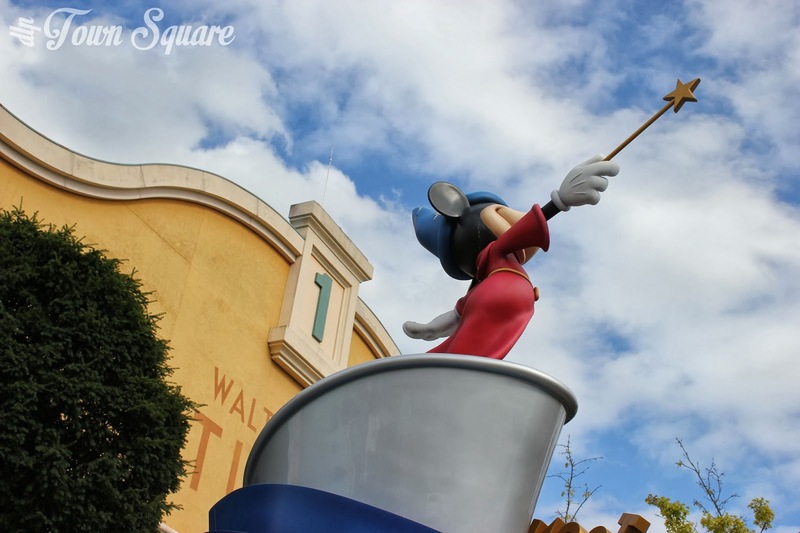 Overall, Disneyland Paris marked this year impeccably, including to Disneyland Paris fans by launching their blog which featured fantastic inside information. Whilst this blog is unfortunately now offline, fans can still watch the videos on Daily Motion. The 15th anniversary of Disneyland Paris felt like the party of the decade, and provided the 20th anniversary with a tough act to follow. We hope the party atmosphere returns to Disneyland Paris in four years time for the 25th anniversary! DLRP Rewind is a feature celebrating Disneyland Paris’s past. Thanks for this article go to DLRP Magic! – The Number 1 Disneyland Paris guide website and their impeccable coverage of the 15th anniversary.